Sincerest Misery is the debut album from this American band that goes by the name of Apostle of Solitude. Founded in 2004 by vocalist/guitar player Chuck Brown, the band released a first, self-titled, demo in 2005. This was followed by a second demo in 2006, Embraced By the Black. 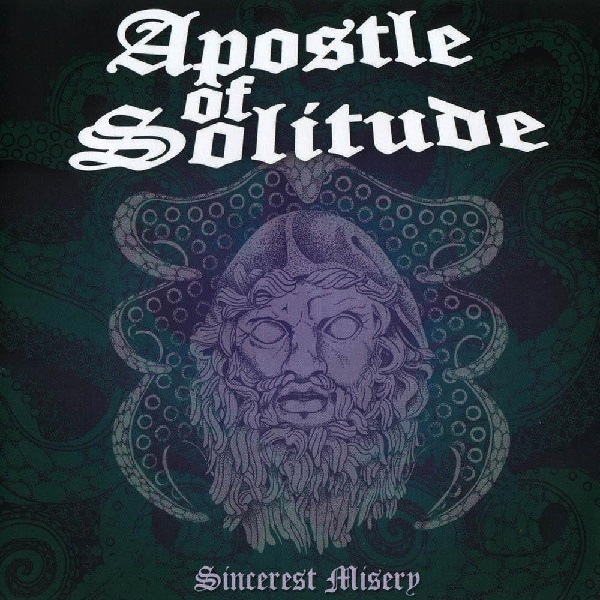 With a name like Apostle of Solitude, one doesn't expect to hear some mainstream Power or Heavy Metal, nor a Black and even less a Gothic ensemble. No, this is nothing else than good ol' Black Sabbath-ish sort of Doom Metal. Sincerest Misery is just cool and greasy music, like Ozzy and Co. used to do, way back when. The guitars are heavy, distorted and much crushing. Pounding drums beat the slow to moderate pace, while strong basses are rumbling along the lines. I only have a bit of a problem with the vocals. I do find them too clean/mainstream and lacking emotional darkness. Available on 2xLP with 3 bonus tracks (Very limited to 250 copies).